Nursery rhymes are a MUST in any homeschool preschool. 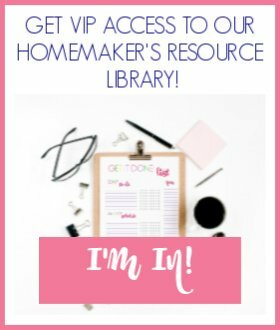 I have always taught my kids nursery rhymes, and now with my younger kiddos I am implementing some nursery rhyme printables for some added fun! Today I want to share with you my Hickory Dickory Dock nursery rhyme pack! These printables are perfect for kids in preschool or kindergarten! I think I’ll always remember the first nursery rhyme I learned in kindergarten. It was “Peter, Peter Pumpkin Eater.” I remember being so perplexed that Peter put his wife in a pumpkin shell. To this day I still wonder about that nursery rhyme. Nursery rhymes don’t have to make sense, and most don’t, but they are wonderful for young children. They are easy to memorize, they help with language and vocabulary, and they create memories that will stay with our kids forever. Nursery rhymes are easy to teach. I tend to focus on one per month. I print out the color version of the nursery rhyme and keep it in my morning time binder. Each morning we say the nursery rhyme together. My littles love to look at the printable and say it with me. They absolutely love the printable puppets. We cut them out and glue them on popsicle sticks. 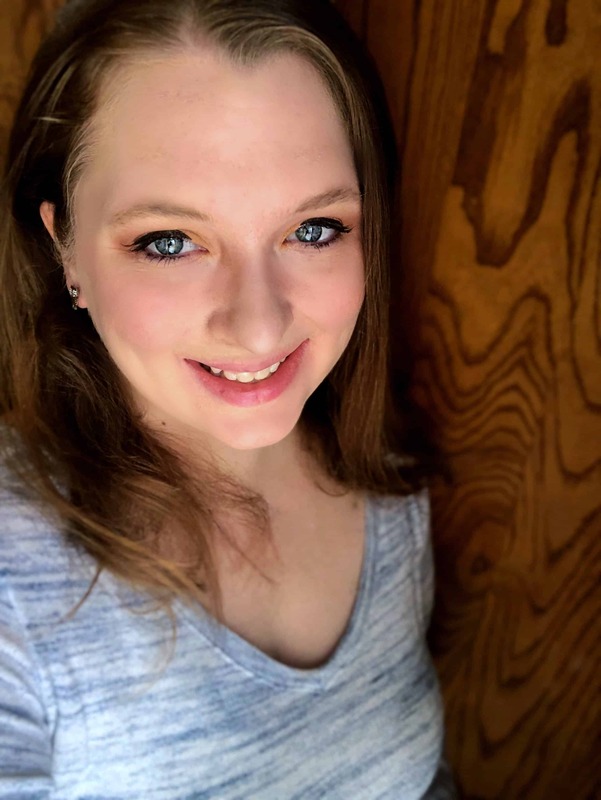 My kids have a little puppet theater that is just perfect for popsicle stick puppets, and they can recreate the rhyme or make up their own story! This particular pack includes a mini book for kids to color and cut out, a sequencing sheet which is great for memory, and two time worksheets that help those just learning to tell time to have a little practice. For my kids, I used Hickory Dickory Dock in conjunction with my “If You Give a Mouse a Cookie” preschool lesson plans. 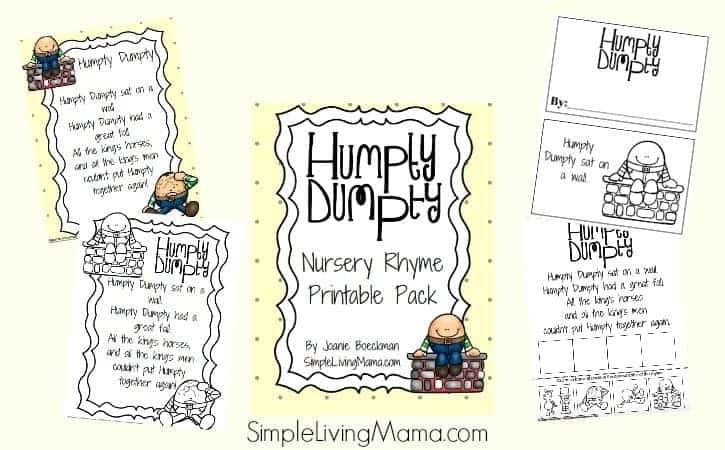 There is a printable sheet of just the nursery rhyme included in that pack, but I also used these activities in addition to our preschool book theme lesson plans. Don’t forget to keep a good nursery rhyme book around to read from, also. I suggest Lavender’s Blue and The Real Mother Goose. 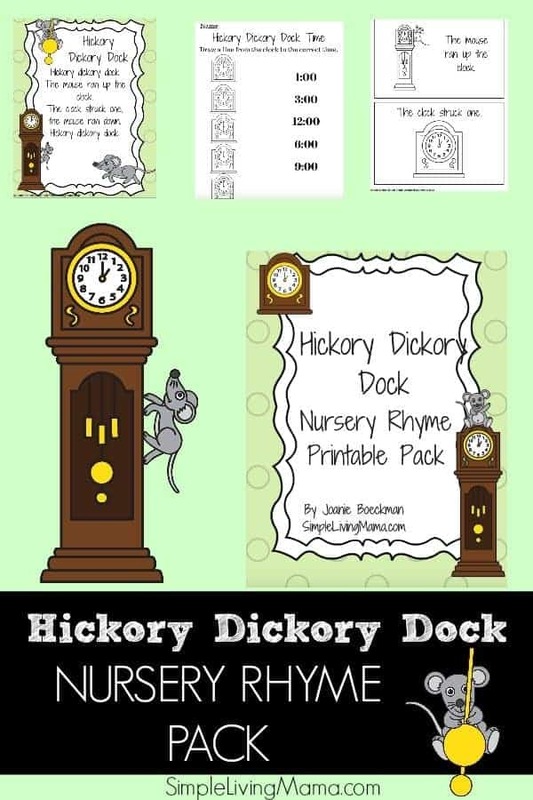 Do you want to include the Hickory Dickory Dock nursery rhyme printables into your homeschool? Check them out in our shop! 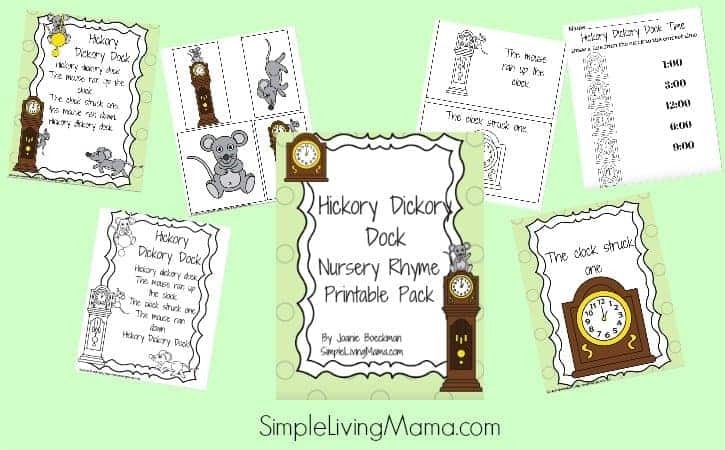 Get the Hickory Dickory Dock Nursery Rhyme Pack here!